K1 Technologies produces very high quality Dodge Chrysler 5.7 and 6.1 Hemi stroker forged steel cranks. We are proud to be a distributor of all premium K1 modern Mopar Hemi engine products. K1 Tech is producing extremely strong 4340 forged 5.7 Hemi crank assemblies that are machined to very close tolerances and are far stronger than a stock 5.7 liter or 6.1 liter Hemi engine crankshaft. K1 produces these excellent modern hemi stroker cranks with two different size rod journals. These crankshafts will fit in either a 5.7 liter or 6.1 liter Hemi engine block. The main difference in the 5.7 and the 6.1 is the stock bore size. Stock for a 5.7L is 3.917 inches and 6.1L has a stock bore size of 4.055 inches. Depending on which block and final bore size you choose to use, you can build stroker hemi engines using these cranks of 393 cubic inches up to 428 cid. Buy the best K1 Technologies small block Mopar Hemi stroker crankshafts here. We offer dedicated customer service, technical assistance and reasonable prices. Stock 5.7L 6.1L Hemi main journal size of 2.559 in. K1 Technologies Dodge 5.7 Hemi 6.1 Hemi crankshaft assemblies are 4340 forged cranks for superior strength and durability. These 5.7 Hemi crank assemblies are ideal for any small block hemi performance muscle car rebuild, street car, hot rod, nostalgia dragster, supercharged, 5.7 Hemi turbo and nitrous engines, all out racing engines, marine, tractor pull, mud bog engines and more. This reluctor gear is the correct one to use with Molnar Technologies Gen 3 Hemi stroker cranks in engines requiring a 32 tooth reluctor. It uses a 4 bolt attachment which is the same as the OEM Chrysler 6.1 crankshaft. 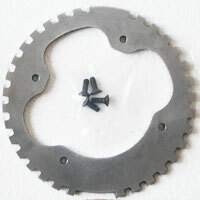 The 2003 - 2008 5.7 and 6.1 used the 32 tooth wheel. Chrysler / Dodge changed the OEM reluctor and engine management system in 2013. If you are working with a 2013 or newer vehicle then this is the proper 58 tooth reluctor to use. If you are building a hard running Dodge small block Hemi engine, why risk using a lesser quality crankshaft in your project? 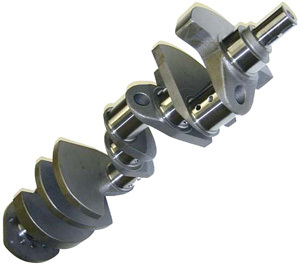 At our discounted prices, you get a premium top quality, high performance K1 crankshaft, for not much more than lesser brand cranks. We also offer a large variety of pistons to work with these small block Hemi cranks including Wiseco forged pistons, supercharged and turbocharged pistons, nitrous pistons, stroker pistons, custom pistons and more. We also sell bearings, gaskets, valvetrain parts and more. If you can not find the engine parts you need, or if you have questions, please contact us and we will be happy to help you.